Web based image editing software are very handy when you have to quickly finetune a web image or a family picture but there is no graphics software like Photoshop, GIMP or Picasa installed on you computer. You may face such a situation when you are in a internet cafe or when you don't have admin rights to install software on the computer. No problem, there are tons of online photo editors to the rescue. Most of these online photo editing apps are free and offer similar workflows. You upload the image on their server, perform editing like crop/resize/zoom/flip/colorize/apply filters/rotate and then save the modified image on your local hard-drive. Here we look at some of the popular photo editing tools including GIFWorks, Pxn8 and Phixr. Phixr Online Photo editor has a sleek Web 2.0 look n' feel and offers more features than any other tool. The edited photos can be directly uploaded to flickr, fotopic, livejournal, photobucket, fotolog.com, buzznet and dropshots without downloading them to your hard-drive. Phixr lets you edit multiple pictures and stay online for about 3 hours. • Tons of photo editing features including Borders, Red Eye Remover, Rounded Corners, Color Fill, Sepia and more. • Phixr supports photo upload by email. • Merge two or more photos into one picture. • Final image can be saved as JPEG, PDF, PNG or GIF formats. • Phixr can extract text from image files [OCR]. • Preview effects before applying them to the image. • Clean, intuitive interface with a desktop like app look. • Photo size is limited to approximately 1280x1024 or 1.3 MB for free accounts. GIFWorks is probably the oldest and most widely used online image editing tool in the market. 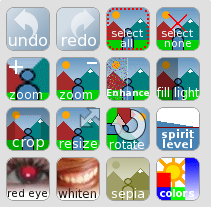 • Comes with a wide array of Photoshop like Filters [effects] like Pixelate, Watercolor, TV Lines, etc. • Image Info dialog gives detailed information about the web graphic. • Some of the editing options open the image in a pop-up window. You may have to turn off the browser pop-up blocker. • Cannot fetch images from other internet locations. PXN8 provides a browser bookmarklet that lists all the images files on any webpage and clicking a particular image will open it for editing in the PXN8 image editor. • PXN8 Bookmarklet save lot of time and hassle. With two clicks, a web image can be opened inside Pixenate. • Balloon tips show help and tips associated with each tool. Great for new users. • Editing images can be saved directly to Flickr. • Save image permanently on the web to webshots and returns a tinyurl of the web address. • Provided lot of editing filters and fun effects like snow, blur, etc. • Info Tool shows the mouse cursor co-ordinates. • No preview option available. • At the time of writing this review, Flickr upload was returning an error. Pixoh web interface is the most impressive of all image editing services. You can change the dimension of the image with the mouse as you would do in some desktop based image software. Pixoh also provides a bookmarklet to capture images from any webpage and edit them inside Pixoh. • Provides only basic editing tools like crop, rotate, resize - no filters or effects. Phixr offers so many sophisticated image manipulating features for free that it can give Photoshop Elements a run for it's money. Pixoh editing style is most user friendly but the service is limited at the moment. Our favorite online photo editor is PXN8 since it has all the image editing features but with a very fast workflow. PXN8 allowed us to grab image from a website, edit it and finally saved the image on webshots without asking for any user credentials. If you just want to resize your images for IM avatars or forum profiles, you may be more interested in online image resizing services like ImageCrop.com or Resize2Mail. They have standard size presets so the final picture is always of the exact dimensions.